Playing by ear is, or should be, the holy grail of playing music. You just about never see a banjo picker, fiddler or mandolin player performing with their nose buried in a book of music notation or tab. It just ain’t done. Of course, there are plenty of beginner musicians who completely depend on tab to get them started. For these people, when they get to the point where they’d like to go out and jam with other musicians, they find it difficult or next to impossible to give up the addition to tab or music. Like quitting smoking, playing by ear seems like a goal that’s just out of reach. It doesn’t help that some people will tell you that playing by ear is a natural ability that is born in you. With this way of thinking, you either have it or you don’t. I don’t deny that natural musical ability seems to be doled out unevenly. Some people have a lot of it, and others don’t even get to smell it. After teaching music for over a half century, I’ve come to several undeniable conclusions. There are relatively few people at the top of the heap who seem to have music flowing out of every orifice. And then there are those people at the bottom who not only can’t carry a tune in a bucket, they don’t even have a bucket! That leaves the vast majority of people in the middle who seem to have enough music in their genes to get by and do fine with a musical instrument if they work at it. For these people, music is like a newly planted seed in your garden. If it’s watered and tended with love, it can grow and blossom. Give up the idea that you have to play the melody all the time in a jam. Approach a song by playing along on the chords. As you play the next chord, it’s likely that you’ll be on a melody note. If you’re not on a melody note, then probably you’re on a harmony of the melody which can be a good thing. 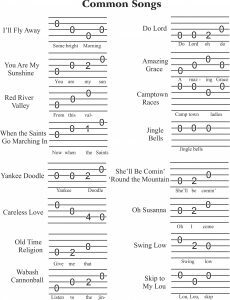 As you go hopping from one chord to another, think of changing chords like you’re jumping on rocks in a creek to keep your feet dry. Each time you jump on a new chord, you’re getting close to the melody. Learn your scales. The notes of a scale are the same notes you’ll need to play melodies. 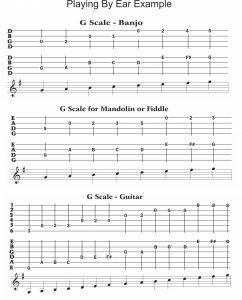 Below are scales for banjo, mandolin, fiddle and guitar. Practice the scale for your instrument every day until you have them down cold. Play the scale forward and backwards. Start in the middle of the scale and go up or down the scale. Now you’re getting somewhere! You can go a long way toward teaching yourself to play by ear by learning to pick out familiar melodies. Start by making a list of simple songs that you’re familiar with. Add to your list as you think of more songs you’d like to try to play. Here’s a tip to help you figure out how to play melodies by ear. Practically all songs start with one of the three notes of the first chord in the song. This information is gold! It’s like I just handed you a million dollars! It should be empowering to know that nearly every song in the world starts with one of the three notes of a chord. To make easier your job of picking out melodies by ear, look at the illustration below. What I’ve done is give you the first few notes of some well-known songs. This should get you started. As you attempt to play one tune or another, you’ll have to figure out whether the melody goes up or down the scale or stays the same. Use the scale to guide you. With practice and determination you can make good guesses of what notes to play. If you spend as much time trying to play by ear as you do reading music or tab, you’ll be well on your way to playing by ear. Thanks, Wayne. Do you think learning to “hear” intervals is also helpful? Yes, of course. Thanks, Thor! This is really funny….I play by ear and I cannot hear…LOL…I have a severe hearing loss and wear good hearing aids. I can play with tab, however I refuse to use it in jams. I have problems hearing cord changes, however I am keeping at it..I just love it all. 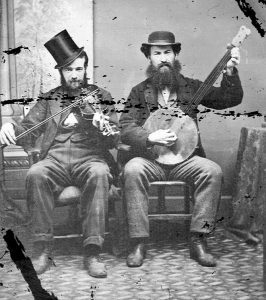 Strange thing happened, I used Wayne’s Old Time fiddle for Ignoramuses to help me learn banjo…It worked for me….I’ll be forever a beginner, but love the trip. On guitar, I can play the melody in all but 2 of the songs in your list by ear, plus about 50 more, (2 of them I ain’t never heard of before). I cannot play any of the chords by ear. I worked on “Roudolph The Red Nosed Reindeer ” before xmas, via “ear think’en” and just about got it. Now, been trying to figger out ”You Are My Sunshine” by ear, and only half close. ( Like to find book with easy tab for that song melody, like the Ignamoramus book for Banjo players) as is what got for banjo. Been one whole year, know about 4 songs and the dang’dest roll with couple slide and hammers. Not even sure its ethical, but puts me in the solid beginner class. – I cannot read music, but tab is so easy, would make a fly fisherman outta Einstein. I’m one of those with a small bucket but big ears, age 74.